As of 1 December 2015, you won’t be able to create a new account on Fontdeck, the professional webfont service, and it will stop working on 1 December 2016. Obviously we will start migrating affected clients’ sites to one of the many alternatives to Fontdeck with immediate effect and there will be no disruption but the closure of Fontdeck is more than a technical inconvenience; For those of us with a long history in web design, it’s passing is more emotional than that. Many years ago the selection of fonts available to web designers was limited to about 12 fonts, most of which were horrible or wholly inappropriate. If a designer wanted to use anything out of the ordinary, they had to use an image (or use a Flash font tools like Sifr or Cuphon that failed on mobile devices) and doing so carried it’s own issues for accessibility, updates/editing, SEO and bandwidth. Then browsers started to support the ability to embed fonts and designers Jon Tan and Richard Rutter conceived Fontdeck, a webfont service which became a joint venture between Clearleft and OmniTI. Soon, more and more professional webfont services like Typekit, Font Squirell, Google Fonts (and their kind) started to appear; Designers started to get the flexibility they craved, access to thousands of fonts that were optimised for websites and, in some cases, designed specifically for legibility on screen. We’ve been long-time users of FontDeck from its earliest days. 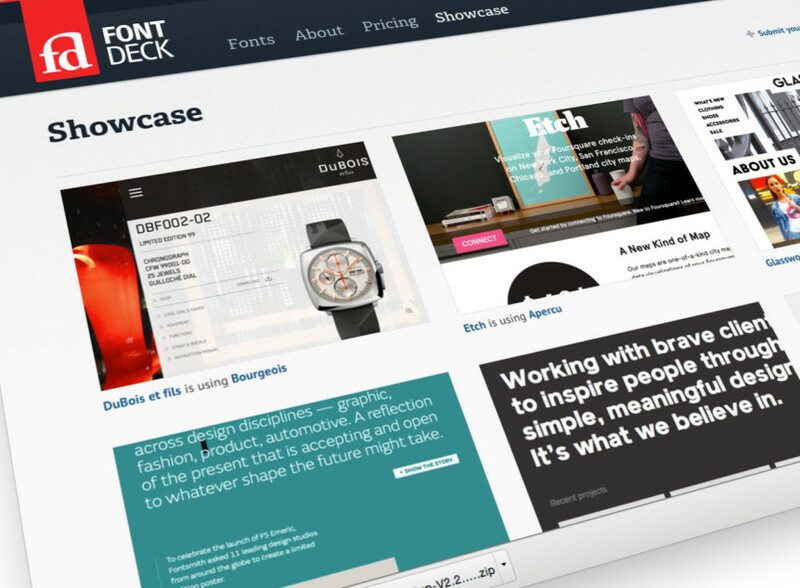 Fontdeck was born as a side project and, in many ways, became a victim of its own success. It has been financially self-sustaining since the earliest days but, as it grew, so did demand and Fontdeck was now taking more and more Clearleft and OmniTI‘s resources to maintain. As they explain on their blog, it slowly became clear that, to continue improving the service and maintaining the infrastructure required to run it was going to require a lot of time and resource, all the while competing with better-resourced alternatives to Fontdeck‘s webfont services like Adobe Typekit & Google Fonts and that doing so would take Clearleft and OmniTI away from their true love and focus: design. It was then that they took the bold decision decision to retire the service gracefully, with plenty of warning (you’ve got a year to migrate), rather than let it wither or fall behind through a lack of investment & support. This is sad, not just because is inconvenient but because it leaves a hole that makes you realise how much you relied on something and took it for granted. FontDeck has been one of those services we have turned to again and again for many years, it was always there and performed its job so smoothly you never questioned it; it became a trusted part of our way of working and, now it’s going, things won’t be quite same. So, yes, it’s sad but I do believe they have done the right thing and they’ve done it in the right way; giving plenty of notice to their users, which is a lot more than you can say for a lot of internet startups.